Today, automation systems vary and each one is designed to solve an important problem. They can reduce costs, improve quality and yield, increase operator safety and increase production levels. Custom development designed to meet a specific user or group of users needs accurately. Is usually created only for this particular organization by a third party under a contract or its development team and couldn't be resale. The key to success is understanding what needs to be automated and how best to achieve this within a business, taking into account budget and schedule. The advantage of user development is the simple fact that it provides functions that are not in the finished product. Developing an application tailored to the needs of the organization implies an increase in productivity. If there is an application designed to improve the performance or meet internal needs, its cost is offset by increased efficiency. If a company needs to be unique enough to guarantee a custom application, then customizing the solution, rather than selecting a complete app, becomes a reasonable solution. Considering that you can purchase off-the-shelf development for dollars, the specialized app requires significantly more resources to develop and, therefore, is costly and risky. When a company decides to start custom development, it must cover all costs associated with the work process. In the end, the cost alone can make up a five-digit range. The off-the-shelf app can afford a low price because the value is distributed among many different users, while the user software is created for one user, the company. A purchasing company must have a deep understanding of its needs and how it wants the final product to satisfy this need. Identifying new needs during the development process is not uncommon, although this leads to additional costs since it takes more time and effort to develop. The risk of frequent changes can lead to a loss of project volume or creep, as it is called in the world of project management, and can lead to the fact that the final product will differ or not correspond to the initial needs. How Does Custom Development work on The Amoniac's Field? One of our core business areas is customized web development from small applications for automating private businesses to large enterprise management systems. Currently, the most significant number of developments is being carried out by us in the field of accounting automation, advertising and marketing optimization, e-commerce solutions. The peculiarity of this direction lies in a rather high degree of functional unification and customizability of the components used, developed by our engineers with an account of the accumulated experience. This allows to significantly reduce production costs, which are traditionally high when developing applications to order due to the need to implement most of the application components from scratch, and successfully work on this slightly competitive market. Amoniac's solutions provide professional web development services with our team of talented developers. IT is a fundamental part of our company, so each member of our company has been tried and tested in our own home court. We take great care in hiring, nurturing, and training skilled programmers who are passionate, experienced, and innovative. 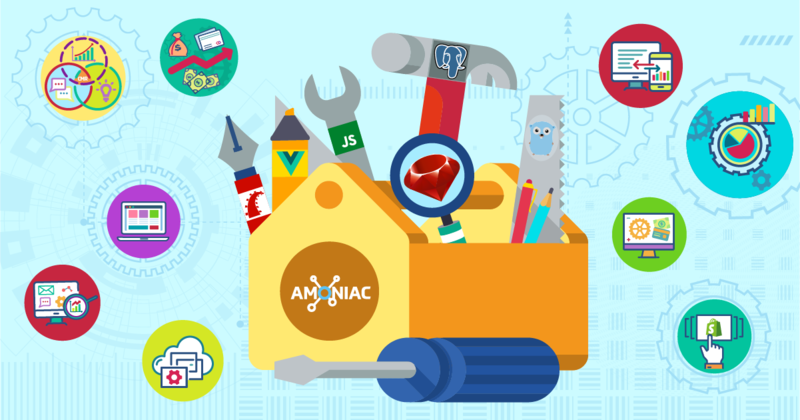 Which Amoniac's Toolkit and What We Can Build for You? 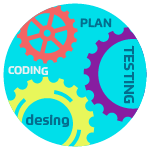 Custom web development requires different technologies. Depending on what the client wants, we can analyze and select the best tools. The Amoniac team can combine several technologies to create exactly what the client’s business needs. And if you don’t know which tool to use? No worries, we can recommend and execute the best option, even if it combines multiple technologies! 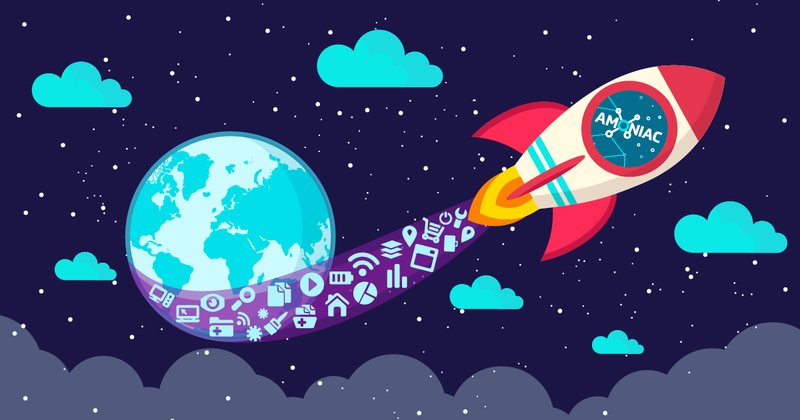 The Amoniac team can handle anything from innovative web development to the classic website build. We create a strategy for managing an organization's relationships and interactions with customers and potential customers. A CRM system helps companies stay connected to customers, streamline processes, and improve profitability. Like an example, our case Ninja CRM that Created for digital marketing agency Exposure Ninja allows organizing the entire database of the company's clients. Both the agency manager and the client have the opportunity to communicate freely in the system, without using third-party mail services, using the instant messenger and CRM mail. All personal information about the agency's manager and the client is displayed in the user account, as well as a list of ordered services, current questions, documents, and reports. Online purchasing capabilities are crucial for online businesses, stores, and any company that wants to accept virtual payments. Our e-commerce web development services stand out for being reliable, secure, convenient, and highly customized. Like an example our case Supplier Portal Platform for the online store operating under the dropshipping model. Connects to final suppliers and gift cards retailers through API or email and allows processing orders very fast. Automatically generates invoices and credit notes for ordered products. We create beautiful web-based apps that can handle high volumes of traffic and collect insightful data. These apps may be standalone, or we can integrate them seamlessly with larger web projects. For example, Natify paid media platform for the B2B market that connects personalized content with target audiences via the programmatic technology. Has own analytics system and integrates with the top marketing automation systems. Generates higher engagement and ROI. If you need help to understand if custom web development can solve your main process problems or you need an application that adapted to your needs, you can contact us directly by hello@amoniac.eu or +372 5770 7573.